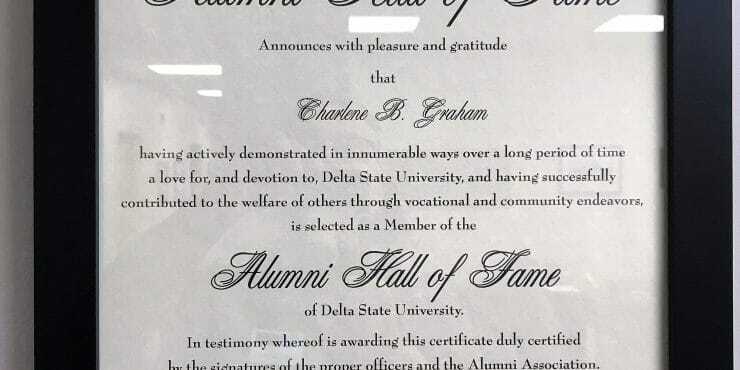 Charlene Bagwell Graham, Managing Partner of Industrial Properties of the South (IPS), was inducted into the Delta State University Alumni Hall of Fame on Friday, October 14, 2016. Induction into the Delta State University Alumni Hall of Fame is the highest honor bestowed upon an individual by the DSU Alumni Association. Established in 2007, the Alumni Hall of Fame is extended to alumni and friends who have achieved professional distinction and made significant community service contributions at the local, national and/or international level, and who have thus brought honor and distinction to Delta State. This year, three distinguished alumni, along with Pleas, will be inducted into the hall: Charlene Bagwell Graham ‘64; Dwight Herlong ‘91; Bob “Pic” Billingsley ’83; and Walter W. Bettinger ’83. IPS is proud of this great honor bestowed on Mrs. Graham. Congratulations Charlene!